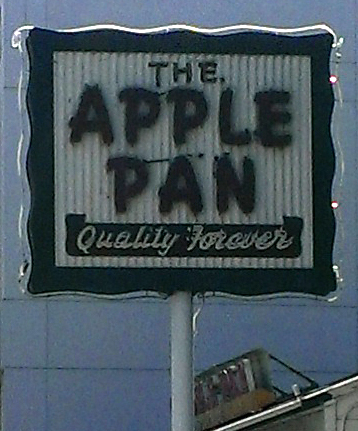 (1947) The Apple Pan, West L.A. | Remains of L.A.
-There are no tables, just a U-shaped white counter wrapping around the red brick grill. Red chairs, linoleum floor, three walls are white with wood paneling and heavy wood window frames, the back wall is red plaid. 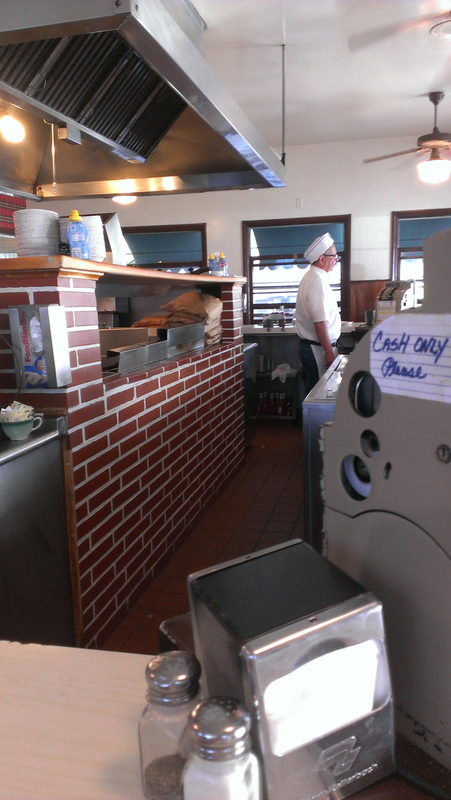 Also on the back wall is a large window into the kitchen, where the pies the place is famous for are on display. Aside from one wooden sign that says, “please do not smoke,” there are no decorations on the walls but it doesn’t seem plain or boring, just clean and simple. -I got a hamburger and fries. The fries came on a paper plate, and after asking if I wanted ketchup and hearing that I did, the counter guy put down another paper plate and poured ketchup onto it for me. The hamburger didn’t even come on a plate; one side was wrapped in lots of waxy paper in a way that made a flat bottom and it stood on the counter in front of me. I wonder how long they have to practice, after getting the job, before they can make the hamburgers stand up like that? The water came in a styrofoam cup. Near as I could tell, the only non-disposable dishes were the coffee cups, which were green and looked like they belonged in a child’s tea set except big. 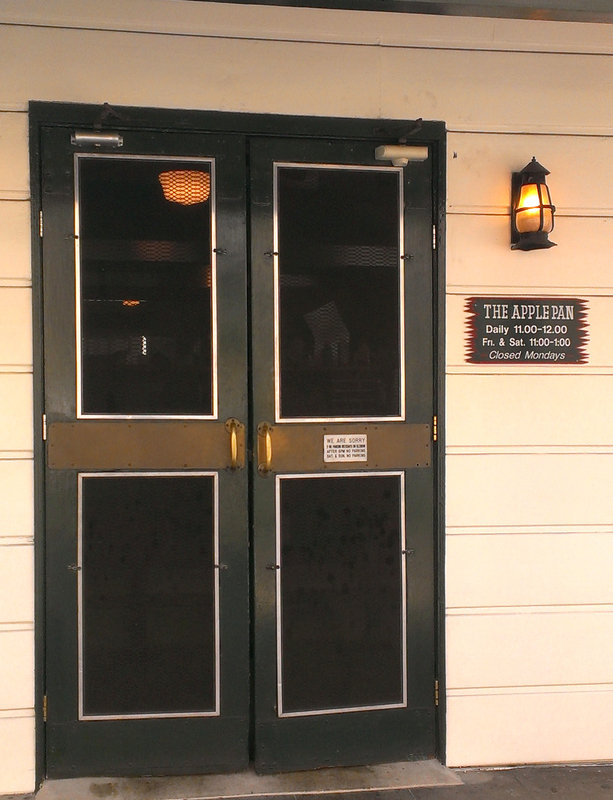 -It was a very hot day, and there was no AC, just many ceiling fans and open windows, and a screen front door. I liked it. It reminded me of old places in the South. The place was still pretty warm, but in a very bearable, not unpleasant sort of way. -A couple came in and upon being handed a menu the woman, who clearly knew they had only hamburgers (and a couple kinds of sandwiches, I think) and pie, joked loudly that she wanted a hot dog and then cackled. The counter guy seemed to know her, he smiled in a pained way and chuckled, which encouraged her. She made the joke three more times before I left. She was wearing glasses with mustard-yellow frames, and a shirt the exact same color. -I’m often sad I can’t eat sugar, but rarely as sad as when I was looking at the pieces of pie people around me were getting. The lady next to me had banana cream, I could see the big slices of banana. It literally made my mouth water, and I don’t even like banana that much. -As I said it was broiling outside and still quite hot in, but the elderly lady next to me was wearing a long-sleeved black wool sweater plus a wool scarf. Also a really bad wig. It’s very possible she was some sort of creature in disguise, except it wasn’t a very good disguise. -The counter guy kept grabbing my water and refilling it, and occasionally pouring me more ketchup for my fries. He was just the best. the sign on the door about when and where not to park is very apologetic. It’s not their fault parking is hard around there. -I had asked for my hamburger without sauce or mayo, and it was a tiny bit dry. I wanted to put ketchup on it, but because of the way it was served it was hard. I finally just dipped it in the ketchup for the fries. It was fine. -A woman was sitting in the corner who was clearly a regular; I noticed she kept pulling the counter guys into conversations. She asked one if he got many days off and he said no, he had to pay too much alimony, and she told another that her father had built a lot of the buildings around the Barrington Plaza, back in the old days. When I went into the ladies’ room, I didn’t realize she was already in there. It was very small, with one stall, and I was going to wait outside but she insisted I come in as she was just washing her hands. As soon as I was in the stall she started talking to me, asking if I had enjoyed my food and telling me she’d been coming there since before I was born. I don’t even like talking to people I know when I’m in the bathroom. -After I was done eating, the counter guy handed me some sort of wet-nap to wipe my hands with. It wasn’t wrapped up or anything, just a wet napkin, kind of cold and maybe lightly lemon scented. It was the exact perfect thing. What I Read While I Ate: Finished “Audrey Wait!” by Robin Benway. Such a great, fun book. What Sort of Ghost I’d Expect to Find if I Believed in Ghosts Which I do Not: A gardener and his son who came nearly every single day for lunch, and always got two slices of pie each. This has to be one of my favorite entries in this blog. I like returning and rereading it; you convey such a simple but delightful meal time.